Happy to email more pics - just ask !! 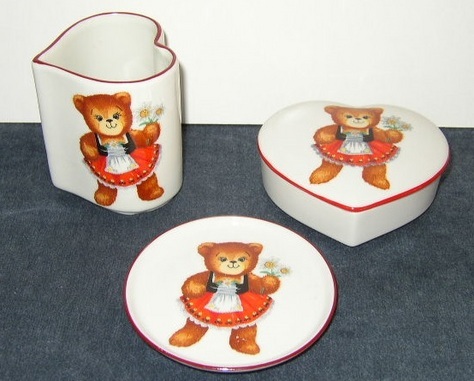 Item #1: $ 9.00 - Set of Three (3) Teddy Bear Collectibles - including: Heart Cup, Trinket Box, & Small Plate - Made in W. Germany. Walt Disney Productions. Heart Cup measures 3-1/4 x 2-3/4 inches across rim; Trinket Box measures 1-1/4 x 3-1/2 x 4 inches; & Small Plate measures 3-5/8 inches across. ALL 3 Items in Excellent Condition - No Chips, No Cracks. Item #2: $ 9.00 - Set of Four (4) Mini, Collectors Plates. Seasons Mini, Collectors Plates: Spring, Summer, Autumn & Winter. Each marked on bottom Reutter Porzellan W. Germany, each measures 3-3/4 inches. Item #3: $ 1.00 - Winter - Seasons Mini, Collectors Plate. Marked on bottom Reutter Porzellan W. Germany, measures 3-3/4 inches.